A conscientious and dedicated young doctor is devastated after making what appears to be a fatal mistake in The Unknown Girl, the latest powerful and uncompromising film from Palme d’Or winners Jean-Pierre and Luc Dardenne. 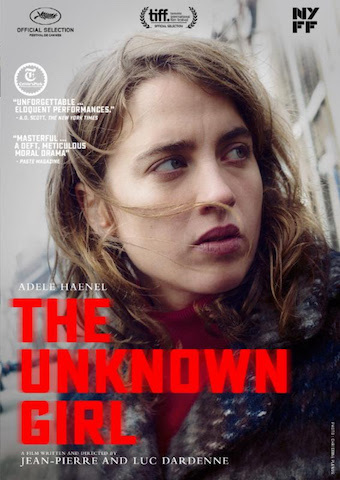 In The Unknown Girl, the Dardenne brothers (Two Days, One Night; Rosetta; La Promesse; The Child) have created a searing saga of guilt and redemption. One evening after work hours, Jenny (Adèle Haenel, Love at First Fight, In the Name of My Daughter), a young doctor, allows the door buzzer at the small clinic where she works to go unanswered. It’s only later that she learns that the person ringing was an unidentified African woman found dead shortly after by the side of a road. Consumed by the thought that she is to blame, Jenny embarks on an obsessive crusade to discover who the anonymous woman was and to see to it that she is not forgotten. Shot through with low-key suspense and the heart-stopping realism that has become the directors’ trademark, The Unknown Girl is both a gripping mystery and a profoundly human moral tale. Co-starring Jérémie Renier (Amant Double, Summer Hours, In Bruges), the IFC Films theatrical release was an Official Selection at the Cannes Film Festival, the Toronto International Film Festival and the New York Film Festival.